A major component of American civil defense policy after WWII was the public spectacle. There were two types: one was based on dazzling people with “science” and the other used quasi-martial displays to stir up patriotic feeling. Two exhibits that were presented in New York in 1948 were intended to make atomic power feel friendlier and more understandable to the general public. The American Museum of Natural History (AMNH) installed the first one in January 1948 and the second one, in August, was at the Grand Central Palace, a now-demolished exhibition space. The atomic energy exhibit at AMNH was sponsored by the Brookhaven National Laboratory (a joint venture of the AEC and several universities, under the umbrella of Associated Universities) and featured an “atomic pin-ball machine,” a contraption with lights and bells that was meant to demonstrate the splitting of a uranium atom. (Boyer, 1994, p. 296). A New York Times article from January 21, 1948 quotes the director of Brookhaven, Dr. Philip M. Morse, as saying that atomic energy policy “cannot and should not be decided by technical experts, but must be decided by a well-informed public.” (New York Times, 1948a). Whether Morse actually meant this or not is unclear, but the history of the AEC and civil defense point to a bureaucracy of government officials and technical experts who sought to soothe the public’s fears about the atom, not give them the absolute truth. 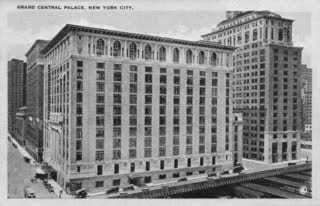 Grand Central Palace, before its demolition (New York City Organ Project, American Guild of Organists, New York City Chapter). The “Man and the Atom” exhibit at Grand Central Palace ran from August 23 to September 19, 1948. The exhibit featured animals that had been fed radioactive sugar, silver dimes bombarded with neutrons to make cadmium, and radioactive fertilizer. (Laurence, 1948). According to the New York Times, “large industrial concerns, leading colleges and universities, and all branches of the nation’s armed forces” were involved in mounting the exhibition. (New York Times, 1948b). The groups involved included the New York Committee on Atomic Information, AEC, General Electric, and Westinghouse. (Boyer, 1994, p. 296). As we saw with nuclear research, a coalition of industry, the military, and academia worked together—this time, to positively influence public opinion about the atom. According to a (possibly flawed) contemporary survey that conducted entrance and exit interviews, visitors leaving “Man and the Atom” felt a decrease in fear and anxiety and an increase in hope about the peacetime applications of atomic energy, which is the outcome the organizers were aiming for. (Kay, 1949). 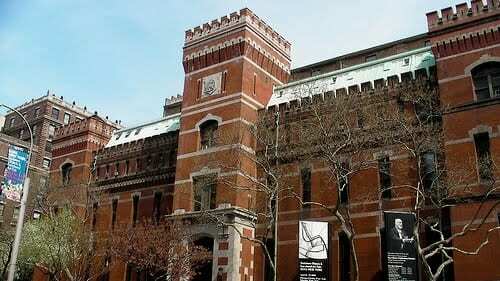 A third exhibit opened on May 12, 1952 at the 7th Regiment Armory (now the Park Avenue Armory) at Park Ave. and 66th St. From an article in the New York Times: “The show combines graphic warnings of what an atomic attack would be like, with lighter aspects of nuclear research. On the heavy side there is a three-dimensional shocker telling the story of an A-bomb in terms of collapsing buildings, roaring fires, and even the cry of a baby.” On the “lighter” side was the “stable of tiny turtles”: one of the turtles was coated in strontium-89 and whenever it neared a counter, bulbs would light up. Local agencies like the New York City Fire Department and the Department of Water Supply, Gas, and Electricity got involved too. This exhibit still tried to make atomic energy fun, but the intensifying Cold War led to a darker tone than the previous exhibits. Civil defense officials walked a fine line between not wanting to scare people so much that they demanded an end to nuclear weapons production and minimizing the danger so that no one took civil defense seriously. This exhibit was accompanied by an “Alert America rally” in Times Square that had the aim of, in Mayor Vincent Impellitteri’s words, “attracting the thousands of additional volunteers needed for this urgent community enterprise.”(New York Times, 1952). Civil defense officials targeted New York City’s African American population with similar rallies and events. Wanting to locate more volunteers, the FCDA saw African Americans as an undifferentiated mass that could be mobilized easily by its leaders, not as a heterogeneous group of people. The FCDA thought that they had located a large group who would welcome the chance to contribute to mainstream American society. At one event in April 1951, the FCDA showed 200 Harlem residents a film about the atomic bomb. A few months later, the new Harlem Committee for Civil Defense (HCCD) held a lunchtime rally. Two thousand people attended and the organizers made a show of having boxers Joe Louis and Sugar Ray Robinson sign up for duty, but the HCCD was only able to get 100 volunteers. They also organized a “parade for preparedness” on 7th Avenue from W. 117th Street to W.148th Street. However, the black population seemed, on the whole, as apathetic about civil defense as the white population. (McEnaney, 2000, pp. 136-137).